88 m a s s a g e & b o d y w o r k n o v e m b e r / d e c e m b e r 2 0 1 8 technique CLINICAL EXPLORATIONS Applied Biomechanics Understanding Force Application By Whitney Lowe 1 Biomechanics is the study of mechanical physics applied to the structure and function of living organisms. The guidelines of mechanical physics help us understand forces involved in various injuries. They also help us maximize treatment effectiveness. In this article, we explore the mechanical principle of force in relation to injury conditions and massage techniques. We encounter mechanical forces every day but routinely take them for granted. 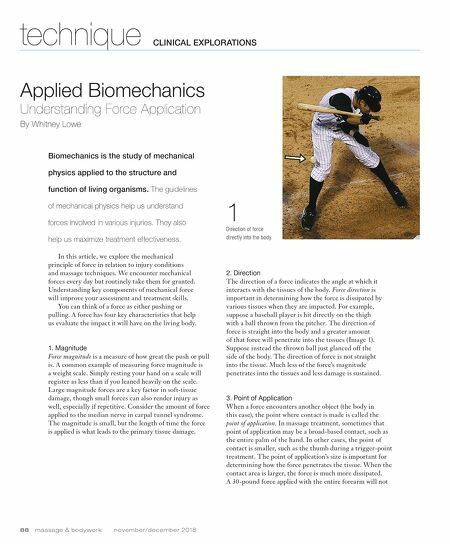 Understanding key components of mechanical force will improve your assessment and treatment skills. You can think of a force as either pushing or pulling. A force has four key characteristics that help us evaluate the impact it will have on the living body. 1. Magnitude Force magnitude is a measure of how great the push or pull is. A common example of measuring force magnitude is a weight scale. Simply resting your hand on a scale will register as less than if you leaned heavily on the scale. Large magnitude forces are a key factor in soft-tissue damage, though small forces can also render injury as well, especially if repetitive. Consider the amount of force applied to the median nerve in carpal tunnel syndrome. The magnitude is small, but the length of time the force is applied is what leads to the primary tissue damage. 2. Direction The direction of a force indicates the angle at which it interacts with the tissues of the body. Force direction is important in determining how the force is dissipated by various tissues when they are impacted. For example, suppose a baseball player is hit directly on the thigh with a ball thrown from the pitcher. The direction of force is straight into the body and a greater amount of that force will penetrate into the tissues (Image 1). Suppose instead the thrown ball just glanced off the side of the body. The direction of force is not straight into the tissue. Much less of the force's magnitude penetrates into the tissues and less damage is sustained. 3. Point of Application When a force encounters another object (the body in this case), the point where contact is made is called the point of application. In massage treatment, sometimes that point of application may be a broad-based contact, such as the entire palm of the hand. In other cases, the point of contact is smaller, such as the thumb during a trigger-point treatment. 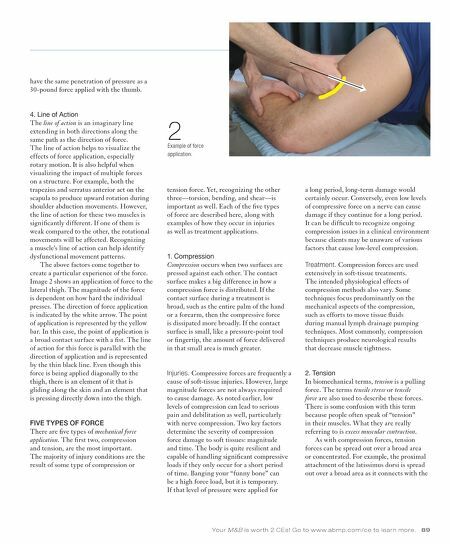 The point of application's size is important for determining how the force penetrates the tissue. When the contact area is larger, the force is much more dissipated. A 30-pound force applied with the entire forearm will not Direction of force directly into the body.